Are you thinking about getting a traveling sprinkler but are on a budget? The Orbit 58322 is one of the best budget tractor sprinkler products available. The price point is slightly more affordable than its competitors. The quality and functionality of the Orbit 58322 traveling tractor sprinkler are similar to its more popular counterparts. Let’s take a closer look at this affordable tractor sprinkler and see how the performance and quality compares. The ultimate way to water your lawn would be to automate the process right? Without having to move the sprinkler every few hours, of course! The Orbit 58322 tractor sprinkler is what you’re are searching for. This self-moving traveling sprinkler has 3 variable speed options with a manual control dial. The tractor will move along any hose so place the hose of the path strategically. While the basic function of a tractor sprinkler may be clear, not all tractor sprinklers are created equal. Some stand apart from others through features such as coverage, durability, color, and supplement (extra-functional) capabilities. The Orbit 58322 is an exceptional tractor sprinkler that stands out in more ways than one. It’s loaded with eye-catching features that will leave both you and your yard quite satisfied. The Orbit traveling sprinkler, like others, can cover 13,500 sq feet when accompanied with a 200-foot hose. The automatic shut-off function comes equipped with this water tractor sprinkler system and is an important feature that keeps your water cost and water waste low. Excellent Coverage of Up to 13,500 Square Feet – While this feature doesn’t stand out much from the coverage of other tractor sprinklers, one thing is clear – 13,500 square feet is quite a large area of coverage! This means that you’ll be able to count on the Orbit 58322 to go in a wide variety of directions and water lawns that exist in the oddest of shapes. Even if you have a lawn that’s much larger than normal, you’ll be able to purchase a supplemental hose that’s compatible with the Orbit 58322 and the sprinkler will travel along, without any interruptions. Rust-Proof Cast-Iron Body – The durability is important when it comes to getting the most out of your tractor sprinkler. Think of it like this – for two or three hours, the sprinkler will be out in the cold, sun, rain, or whatever other elements it happens to be exposed to. You’ll want a tractor sprinkler that’s built to handle such conditions. The Orbit 58322 is the tractor sprinkle you’ll want if you’re looking for durability. Its body is composed of a hardy cast-iron build and is topped off with a rust-free paint that will surely hold up in the face of rough weather or temperatures. Stable Passage of up to 55 feet – The Orbit 58322 Traveling Sprinkler will sprinkle your lawn with all the necessary water it needs, regardless of its size. You’ll find that the hose it comes with has the ability to extend 55 feet across your lawn, making the coverage options of this Orbit Sprinkler almost Unlimited. As we stated earlier, you can purchase a supplemental hose for it to ride on, in the case that the 55-foot hose isn’t long enough for your lawn. Three Speed Setting – If you’re worried about how fast or how slow your lawn will be drenched with water, worry not – the Orbit 58322 Traveling Sprinkler can travel at three different speeds. Whether you want your lawn to be soaked in water or lightly drenched, this tractor sprinkler should be able to accommodate your needs. Automatic Shutoff Ability – The Orbit 58322 is unique in that it comes with the ability to shut off automatically. This automatic shut off isn’t initiated by anything electronic, either – all you’ll have to worry about is setting up a ramp on the path of the tractor sprinkler which stops its movement. The halt in movement triggers a reaction that shuts off the entire apparatus. The spray coverage can be adjusted from 15 feet up to 50 feet. The adjustable rotary spray arms allow users to specify the distance of water spray as needed. 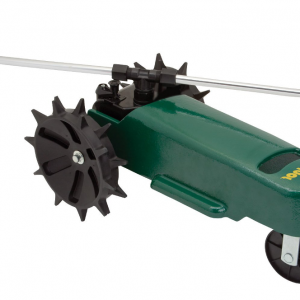 This water tractor sprinkler can be used for both large and small lawns. This rust-proof traveling sprinkler has a cast-iron frame that is built to last a lifetime. Stability and durability are certainly important qualities of the Orbit 58322. When watering a narrow area of 15 feet or less, turn the sprinkler’s aluminum arms downward to reduce the watering radius. This is the traditional setting for narrower areas of your yard. If you want to water a larger area of your lawn (within a diameter of 55 feet) adjust the sprinkler’s aluminum arms upward. This increases the tractor sprinkler’s spraying radius. You can use this setting to water your surrounding garden areas as well. When the wind picks up, you can adjust the tractor sprinkler’s arms to be horizontal and improve the watering efficiency. When the Orbit traveling sprinkler is in its highest gear, the sprinkler will travel 37 ft/hour and spray about ¼ in. of water. When in its lowest gear, the sprinkler travels 21 ft/hour and apply roughly ½ in. of water. If you’re looking for a tractor sprinkler that covers a large amount of area and is relatively versatile, the Orbit 58322 is a great buy. The tractor sprinkler comfortably can cover large yards and has the ability to take on additional lengths of hose. Overall, we’d recommend this tractor sprinkler due to its massive coverage, moderate speed, and sturdy exterior build. The only thing we’d recommend is keeping an eye on how often you use it!